Just when we thought this wannabe third world war was over, 3 of Christopher's former colleagues from no where probably trying to gain attention accused him of being a woman beat . 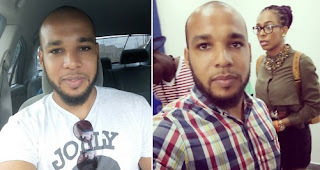 They claimed while they were all in Delsu , Christopher impregnated his former girlfriend with the name Dammy , and that he forced her on several occasions to do series of abortion . They also insinuated that TBoss might just be a “ runs girl ”, you can really judge a book by the cover you know..
Come Chris, you are talking of Karma ? You of all people ? karma definitely awaits you for all you did to Dammy while in Delsu , see someone talking of karma , you that was busy beating up your girlfriend ins school upandan , now coming here to claim saint for an assault on your sister . Who is better off between you and kemen? Just shut your mouth there . I don't support kemen’s actions but you have no right to speak of karma else the blood of the babies dammy removed for you would come knocking this night . you even have mouth to wish same on AY's daughter whereas you are worse off. Mstcheeew . Park well else your story go full blog tomorrow morning . Enjoy your 2 minutes of fame . Yo blocked my friend abi? Woman beater, you remember dammy in delsu how you beat her and ask her to abort for you? Now you're claiming saint and talking of kemen. 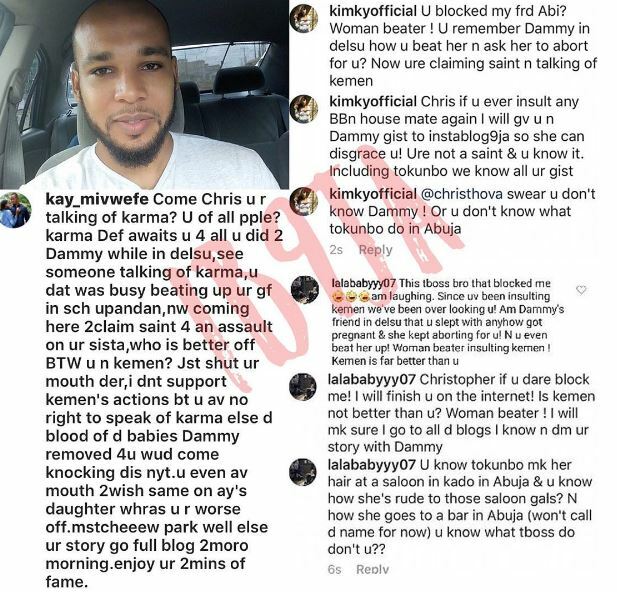 Chris if youe ven insult any of BBN housemate again i will give you and dammy gist to instablog so she can disgrace you . You are not a saint and you know it Including tokunbo we know all your gist. @ christhova swear you don’ t know dammy ! or you don’t know what tokunbo do in Abuja . So you that blocked me . I'm laughing . Since you have been insulting kemen we have been over looking you . Am dammy ’s friend in delsu that you slept with anyhow, got pregnant and she kept aborting for you . To make the matter worst, you even beat her up! Woman beater insulting kemen! Kemen is far better than you . Christopher if you dare block me ! I will finish you on the internet ! Is Kemen not better than you? Woman beater ! I will make sure I go to all the blogs I know and DM your story with Dammy . You known Tokunbo make her hair at a saloon in kado in Abuja and you know how she's rude to those saloon gals ? N how she goes to a bar in abuja ( won't call the name for now ! you know what tboss do, don’ t you.